At the Locals’ Conferences Council/Player Conferences Council meeting (L to R): Western Conference Delegate and Local 105 (Spokane, WA) Secretary-Treasurer Rachel Dorfman; OCSM President and Local 247 (Victoria, BC) Member Robert Fraser; Professional Musicians of Texas Delegate and Local 72-147 (Dallas-Ft. Worth, TX) President Stewart Williams; Southern Conference President and Local 655 (Miami, FL) Secretary-Treasurer Jeffrey Apana; New England Conference Secretary and Local 400 (Hartford-New Haven, CT) Secretary-Treasurer Candace Lammers; TMA Delegate and Local 369 (Las Vegas, NV) Member David Philippus; ICSOM Chair and Local 47 (Los Angeles, CA) Member Meredith Snow; RMA President and Local 47 Member Marc Sazer; ROPA Delegate and Local 166 (Madison, WI) Member Naomi Bensdorf-Frisch; Mid America Conference President and Local 3 (Indianapolis, IN) Secretary Martin Hodapp; Canadian Conference President and Local 276 (Sault Ste. Marie, ON) Secretary-Treasurer Paul Leclair; Mid-States Conference of Musicians president and Local 70-558 (Omaha, NE) Secretary Dan Cerveny; RMA Secretary and Local 47 member Steven Dress; Illinois State Conference Delegate and Local 98 (Edwardsville, IL) Secretary Jerrold Cobetto, and New Jersey Conference President and Local 399 (Asbury Park, NJ) President Dorian Parreott. Since the mid 1980s, during years when there is no AFM Convention, leadership from AFM conferences meets with AFM officers and department directors to discuss issues relevant to their particular constituents. The Locals’ Conferences Council (LCC) consists of leadership from all the AFM’s locals conferences and essentially represents the entire AFM membership. The Player Conferences Council (PCC) consists of leadership from all the player conferences and specifically represents AFM symphonic, recording, theater, and touring musicians. 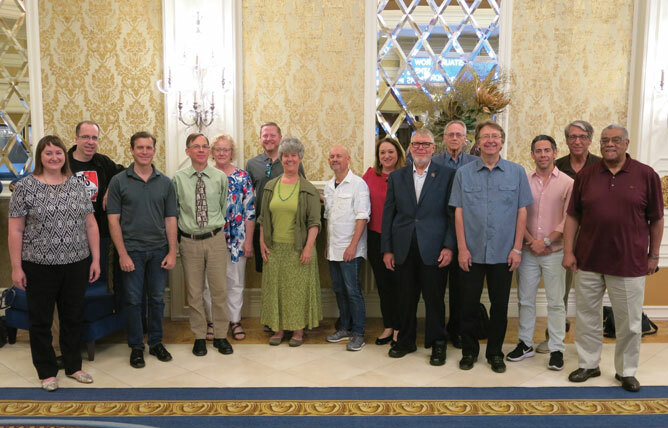 On June 17-18, the LCC/PCC Conference was held at the Westgate Resort & Casino in Las Vegas. Saturday began with a meeting of AFM leadership and staff with delegates from both the LCC and PCC. A presentation on the current status of the pension fund was followed by several individual reports. AFM President Ray Hair spoke about office relocation and industry negotiations and AFM Secretary-Treasurer Jay Blumenthal reported on AFM finances. AFM Touring/Theatre/Booking Division Director George Fiddler talked about his department’s work. AFM directors Michael Manley of the Organizing and Education Division, Paul Sharpe of Freelance Services and Membership Development, and Rose Ryan of Communications gave reports. Director Pat Varriale reported on the work of the Electronic Media Services Division (EMSD). Symphonic Services Division Director Rochelle Skolnick talked about resources available to orchestra musicians. Diversity, Legislative, and Political Director Alfonso Pollard relayed his efforts representing the AFM on Capitol Hill. On Saturday afternoon LCC and PCC met individually to prepare their reports for presentation to AFM leadership on the following day. Sunday was another opportunity for a joint meeting of the LCC and PCC with AFM leadership and staff. The LCC portion of the meeting covered a wide range of questions and concerns. The purpose was to solicit information and offer suggestions that might help the AFM aid local officers in the performance of their duties. Main topics were: maneuvering around the AFM website, existing and potential organizing campaigns, local officer education, and general messaging about the AFM to musicians and the public. Interactions between LCC delegates and AFM representatives were extremely informative and greatly appreciated. Thanks to Mid America Conference President and Local 3 (Indianapolis, IN) Secretary Martin Hodapp and Local 105 (Spokane, WA) Secretary-Treasurer Rachel Dorfman for co-chairing the council. The Player Conferences Council consists of leaders from the Organization of Canadian Symphony Musicians (OCSM-OMOSC), the Regional Orchestra Players Association (ROPA), the International Conference of Symphony and Opera Musicians (ICSOM), the Theatre Musicians Association (TMA), and the Recording Musicians Association (RMA). Their conversations throughout the weekend centered on how to support the health of our US pension fund, organizing and educating our respective members, and sharing experiences in negotiations and other activities over the past year. The LCC/PCC Conference meetings are invaluable resources that bridge the gap between national conventions and provide attending delegates with updated information that they can share with their locals and constituent groups. For the last 18 years, Benoit Glazer of Local 389 (Orlando, FL) and his wife Elaine Corriveau have run the Timucua Arts Foundation—until recently, a self-funded nonprofit that began in their living room.